It’s like an egg sitting in a little wooden shed. 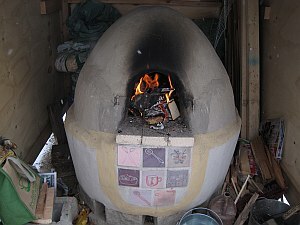 The egg has tiles on its belly that are printed with artwork by local residents. 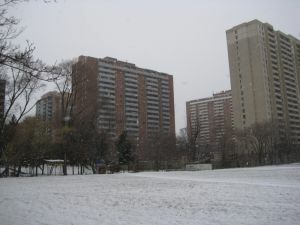 Mabelle Arts runs art programs in this Toronto Community Housing complex, and the oven was built during their summer program. 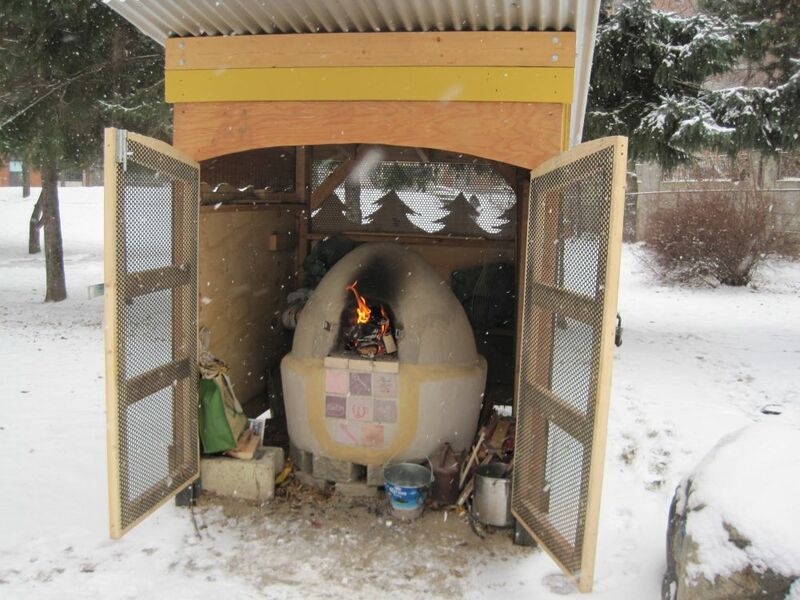 Led by a cob-builder James Davis, the residents used their hands and feet to shape the oven and their outdoor space. Since it was built two summers ago, it’s been through some vandalizing. It wasn’t until the fall that the oven was ready for baking again. 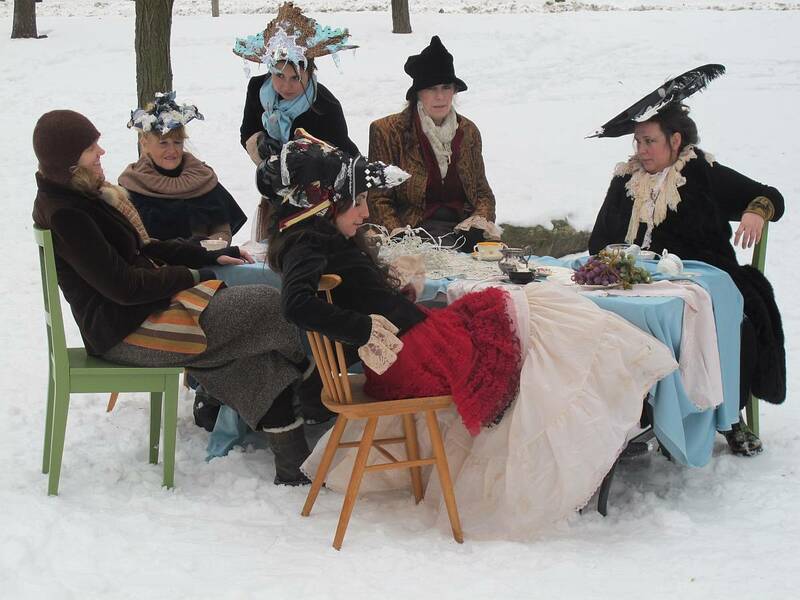 Leah Houston, the director of Mabelle Arts, and I saw this winter as a test period when we’d try baking once a week. The flame sometimes comes out the front of the oven. Even though the oven is small, it takes five or six hours to heat up in the cold weather. Because it is so small and has no chimney, the flame often comes out of the mouth, so someone has to watch it, especially during the first couple of hours. Mabelle Art’s office, where the baking tools are stored, is in the building up the street, and the kitchen where we prepare dough is in another building down the street. For the kitchen, we ask at the office to be let in, but the office only opens at 9 a.m. Distance, limited access to facilities, and weather made baking here challenging. Some days, I would make a sourdough at Dufferin Park, take the subway with the dough on my lap, start the fire at 9 a.m., watch it while running or jumping around to keep warm, go to the kitchen or office to form dough, back to the fire-watch again, and bake. Other times Leah, other staff, or community members watched the fire for me. In that case I would make yeasted dough after lighting the fire. A closeup of the front of the oven. Distance gets in the way even more when it comes to the actual baking process which involves carrying formed dough, loading the oven, checking for doneness, and taking the loaves out. If they were not ready when you came back to check, you would have to wait for another while till they were fully baked. Five minutes feels so long when standing in the cold at the end of the day. Plus, the heat on the hearth was always uneven, so you would take some loaves out while leaving others on the hotter part to bake longer. 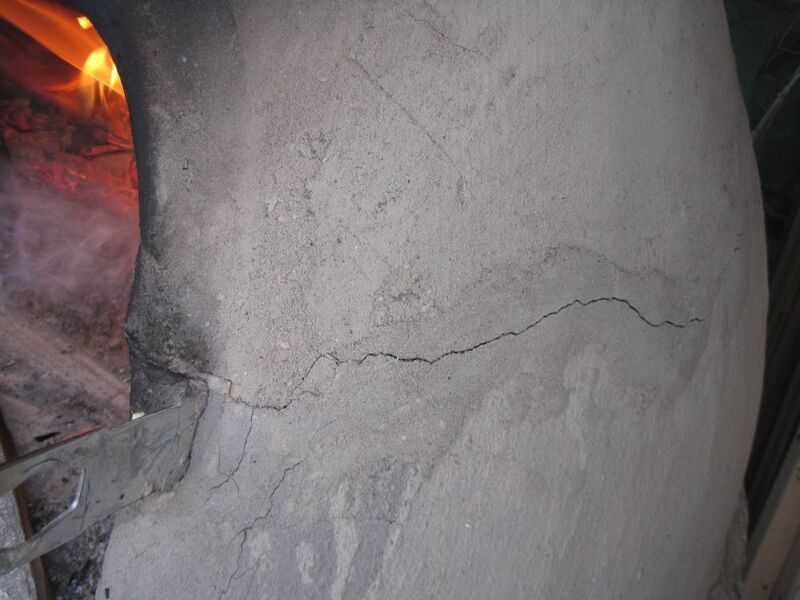 Then wait again… Uneven heat was, as was the case with Lefferts House oven in NY, probably because of piled coals that prevented direct contact between hot coals and the hearth. It often felt very inefficient. On the first baking day, I could say nothing but just laughed when I finally took out three partially burned loaves in the dusk of the evening. But efficiency can’t be measured just by the product of a day, but by the experience gained through the process that will make things work in the longer term. White sourdough & sweet potato-raisin loaves the last baking day. And we did make progress—the second time, we baked 7 loaves and three pans of apple crumble, and the third time we had 15 loaves. 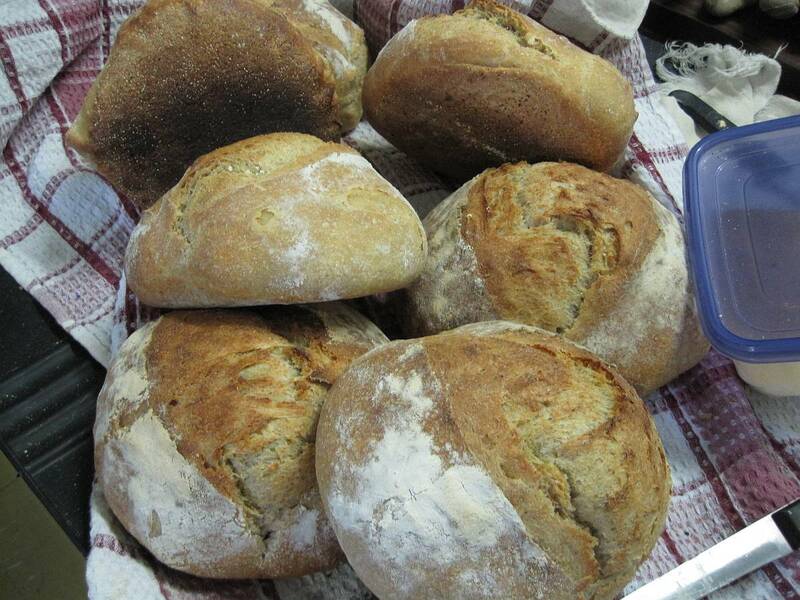 The loaves were smallish, about a pound each before they were baked, and the oven could take 6 or 7 of these. It was funny in a sense that we started baking in the most challenging time of the year on top of already challenging settings. It seemed quite normal though, for Leah who is always after something extraordinary and the Mabelle Arts team who are immune to her wild ideas. The Mabelle Arts team. Photo by Sean Frey. So every baking day, we would laugh how ridiculous it was while sampling bread with leftover Somali tea that they served at their sewing program. It was, in another sense, good that we tried in the winter because it will feel much easier in the summertime when it is not torturous to stay outside. With other art projects taking place in this little parkette, fire can always be attended (with an increased risk of children poking it more than it needs to be), and the entire baking process could happen there too. It will be interesting to see what comes out of the egg once it’s warm. 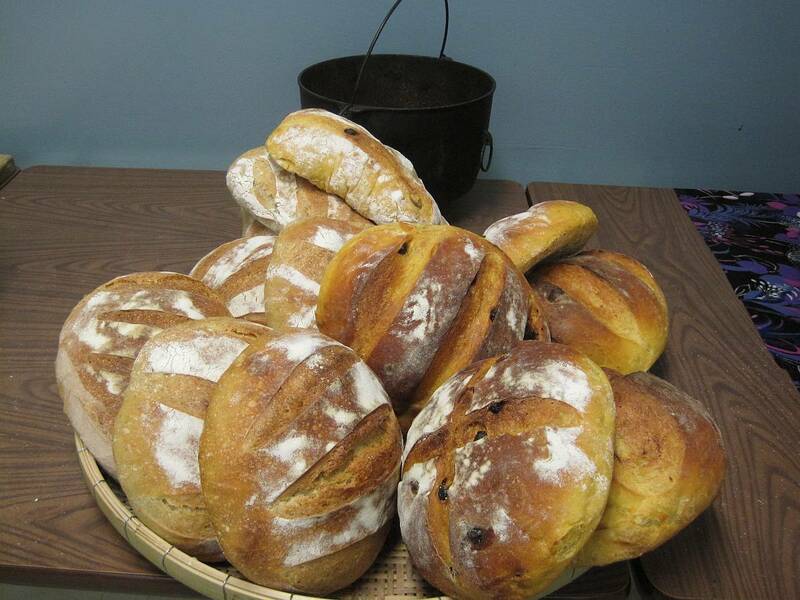 For more information about the oven and Mabelle Arts, visit the Mabelle Arts oven. 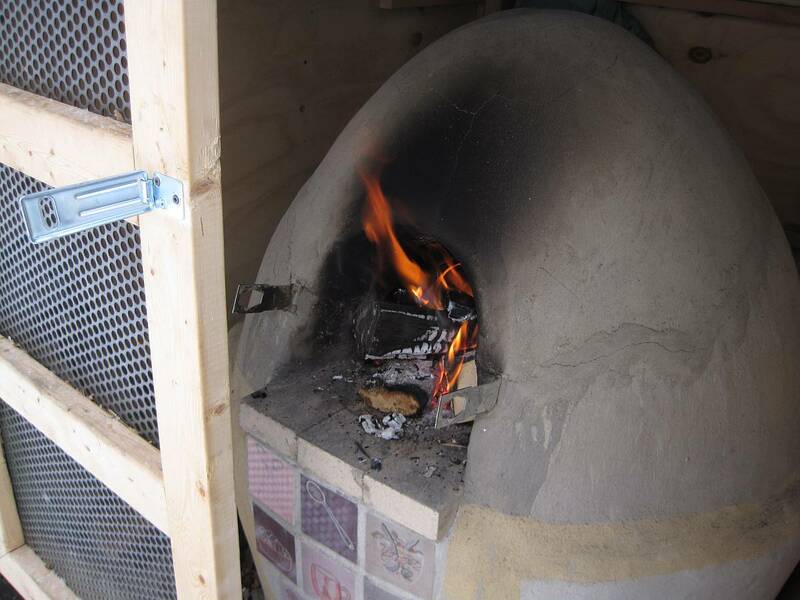 Also, take a look at a little art film about baking in the Mabelle oven. The oven and TCH buildings from the east side.